In September I had a chance to get to know people in the Maker Movement by attending Maker Faire New York. I had a blast and will be writing more about why I, as the Radio Doer went along with our Maker Doer Tamara Clammer and co-worker Kelly Allen. (hint: it has to do with building more relationships between Community Media and Makers/Hackers). I met many creative tech people and engineers – but the work of the crafters also caught my eye. I don’t knit, but I love fabric arts and independently made jewelry, so a few things caught my eye. The Brown Paper Tickets booth at was right next to a main thoroughfare – so I saw some incredible crafty crafts and wear-able art. I loved this scarf. Maybe you’ve seen art like this just hanging around people’s necks, but I haven’t. The whimsy of it just made me happy. I didn’t get her name, but she said she just graduated from school where she focused on animation. 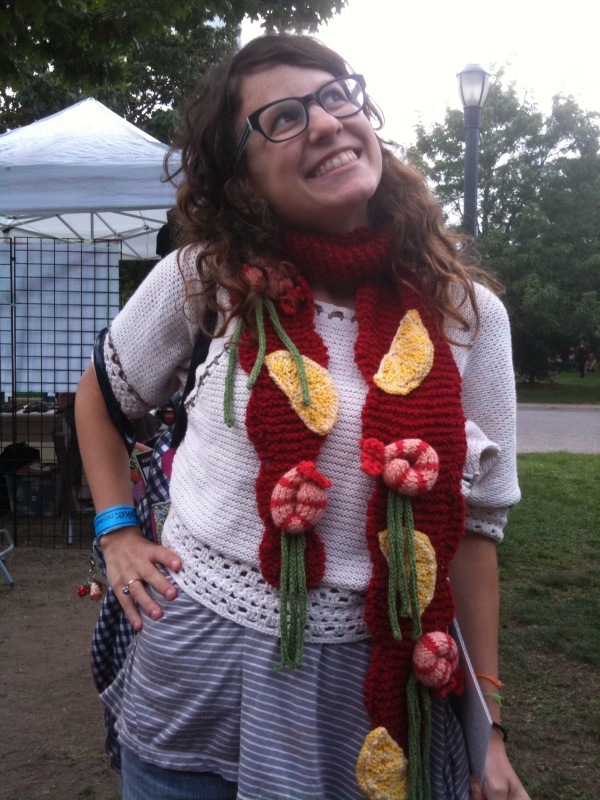 She calls her stuff Scarf It Down Knit Delicacies. Check out her Etsey Store! Tags: COATT, Maker Faire New York, morse code, News, Radio/New Media Doer, Rebecca Coagan, Sabrina Roach, Scarf It Down Knit Delicacies, Sonya Phillip.